Answer: As explained in last week’s column, dark clouds of dust block our view of the galactic center. There’s a lot of dust floating around in space, and over great distances it is opaque to the light our eyes can see. Other types of radiation, like infrared and radio waves, can penetrate this dust. Telescopes that “see” this type of radiation have actually provided images of what’s behind the curtain. And what they show us is truly amazing. The center of our Milky Way galaxy is about 28,000 light years distant. It is surrounded by a central bulge containing very old reddish stars and a lot of dust and gas. The central bulge is about 13,000 light years in diameter, so it would appear fairly large (about 26°) in our sky. A hypothetical view of our galactic center is crudely simulated above. I say “crudely” because this is really the edge-on image of another galaxy (NGC 891) pasted into the view with the correct scale size and orientation. 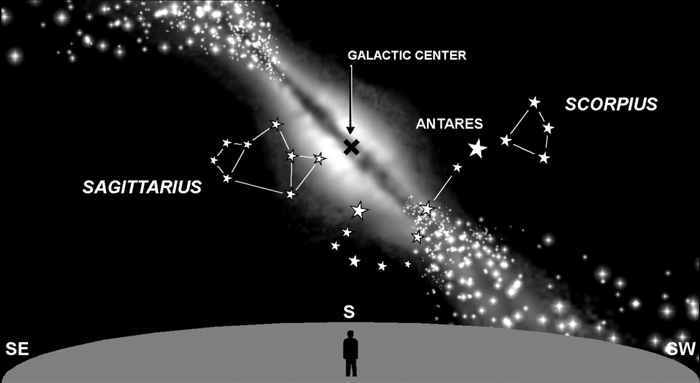 The stars that comprise Sagittarius and Scorpius (and all the other stars we can see in our sky) are much closer, and would be superimposed on this spectacular view. Too bad space is so dusty.